Reporting on the people and happenings in the Alberta Arts neighborhood of Portland, Oregon. There are a lot of street artists around Alberta but none take the name quite as literally as Nancy Hiss. Nancy is in the process of writing the names in chalk on the sidewalks of Portland of all the coalition forces who have died in Iraq since the beginning of the war. Considering that as of 8/31/07 4,035 coalition forces have died, this is no small commitment. There are no firm numbers on Iraqi dead but the low end estimate is 71,000. Nancy is writing the soldier’s last names in order by the date they died. Fittingly, she started the project at 5:30 AM on Memorial Day in front of the Federal Building. At 15th and Alberta, she had completed six miles of names. At 22nd and Alberta, she had completed the names of those who died by the end of February, 2006. Nancy, who is an architect by day, gets up early to work on the project each weekday and works on it all day on weekends. She said it was important to work on the project every day. I asked her how she got the idea for the project. She had been taking an art class and noticed that her art was highly personal, in a way self-involved. 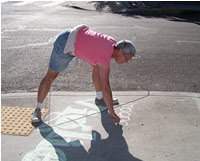 The idea to write the names in chalk on the sidewalks came to her when she noticed that the work of many of the younger students was very political. I asked her what she’s learned from the project and she said she’s noticed trends. She was surprised at how many Hispanic names are on the list and she’s noticed a marked decrease in names not common in the U.S. which demonstrates the decline in support for the war around the world. Nancy started writing names at 5th and Broadway and at 6th and Yamhill had completed the names of those who died prior to President Bush’s “Mission Accomplished” speech given on May 1, 2003. I’m not great with distances but I’m guessing that’s little more than half a mile. It’s a stark example of how many people have sacrificed their lives since Bush swaggered across that aircraft carrier. Nancy says her goal for the project is to get people talking about the war. Most of us are overwhelmed by the unrelenting bad news coming out of Iraq and have given up on being able to make a difference. Nancy and her work are a great example of how we can each make a difference in our own unique way. If you would like to help, contact her at dan.namesproject@gmail.com or visit the website at http://www.iraqnamesproject.org/. If you’ve ever been in Close Knit, you know it’s packed with a jaw-dropping variety of yarn and knitting samples. It can be pretty overwhelming. I went in a few days ago for my weekly visit and the first thing I saw were scarves, hats and wrist warmers the likes of which I have never seen before. The yarn was soft as cashmere, less fuzzy and had more backbone to it. The patterns were subtle, beautiful and unique. Yet these amazing patterns seemed like something this newbie could do with out winding up at the state mental hospital. As I gushed, Sally, who owns Close Knit, told me that the author of the book the patterns came from, Artic Lace: Knitting Projects and Stories Inspired by Alaska’s Native Knitters, would be speaking this weekend. Artic Lace tells the tale of the Oomingmak Musk Ox Producer’s Co-operative, the knit artwork they produce and the cultures behind the symbols in their work. 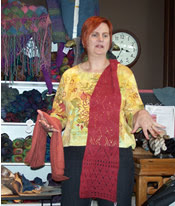 While I was in the store, Sally and her staff hovered over 12 balls of yarn as if each one was a three carat diamond. This was the yarn described in the book. It’s called Qiviut and comes from the under-coat of musk ox. It’s one of the rarest yarns in the world and costs about $80 for enough yarn to make a scarf out of. Normally, 80 bucks for something I could hold in the palm of my hand is easy to walk away from but I had to have a stern talk with myself not to buy it. (I’m still having that stern talk.) Fortunately, you don’t have to use Qiviut to do the patterns in the book. Listening to Donna speak, you could feel the love and respect she has for her subject. I bought her book, came home and found it to be a good read. What I really appreciate about Artic Lace is the example of how Native American culture is vital and producing beautiful and functional artwork. Like the knit scarves Donna writes about, Artic Lace weaves together tales of the Eskimo cultures that inspire the artwork behind the patterns and provides the directions for creating the artwork yourself. As a knitter, I am thrilled to have a guide that will show me how to create meaning in my work; ultimately taking it from novelty to artwork. Yeah. I got a life. But my professional website and blog often leave me thinking about and writing about things that aren’t appropriate for that venue. So. You decide. Is this the dregs or the good stuff?